YES!! Geocaching is a world-wide treasure hunting game that you can play with your family, friends, and even by yourself. There is no limit to what you can find while you're geocaching. How about a X-mas tree - yup, that too! Geocaching will quite literally take you places you have never been and let you see things you have never seen before. My book explains what the fun game of geocaching is all about. 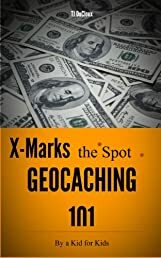 It talks about hiding and finding caches, how to log a find on your computer, and how to just get started. Buy your copy now and start having amazing and fun adventures now!